I'm a bit excited about my shopping trip a few days ago. You see, here in Sugarloaf Key, Florida, there are literally no craft supply stores. I have to purchase every single scrappy item online, which is no fun at all. But, the other day, I popped into the local Bealls and found a few hidden gems. Can you believe it? I know they aren't brand new collections or anything, but they are new to me! The photo is of me and my awesome stepmother. 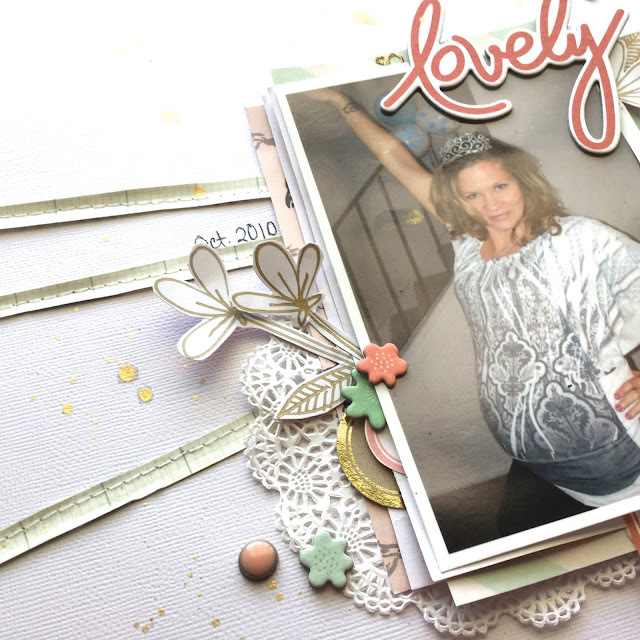 I layered some patterned paper behind my photo and added a doily from my stash. I added my journaling, date stamp, a mini gray clothespin and scattered a few purple sequins from my stash to finish my page. Have you had a recent haul? I would love to here about what you found. I absolutely love living on a tropical island. I'm originally from the Philadelphia area and my husband is from the mountains in North Carolina. He and i moved to the Florida Keys about 6 years ago and knew it was our forever home. We are lucky enough to wake up every morning and see water surrounding our tiny island. We truly appreciate our surroundings. This got me thinking........what does Cole think? He was born here and this is all he knows. This is his normal everyday life. I wonder if he will appreciate it when he's older. I made this page for my new Youtube Series: STUDIO CALICO DAY. 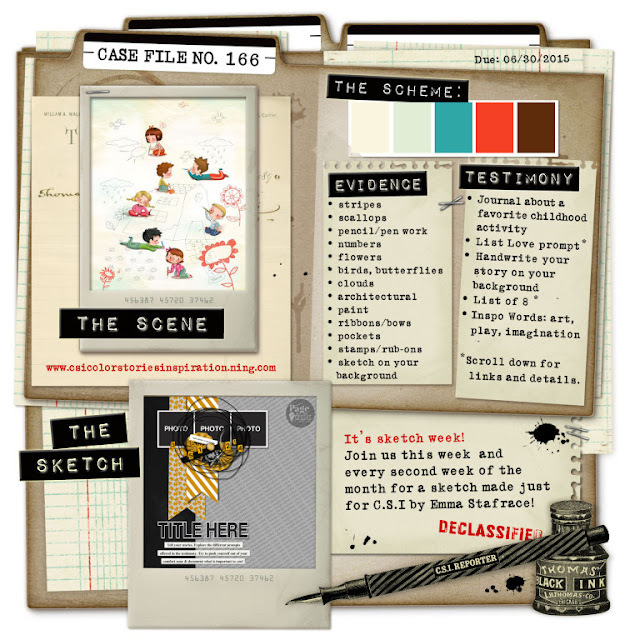 Every week I will use my current Studio Calico Kits and take inspiration from the Studio Calico Blog. This week, I used a Sunday Sketch, a Weekly Challenge, and a Tutorial. 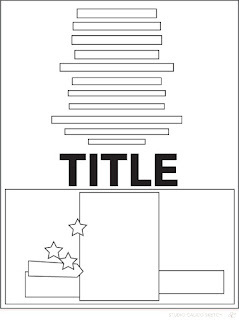 The Weekly Challenge was to use a bold, floating title. I was very inspired by a Tutorial by Marcy Penner. 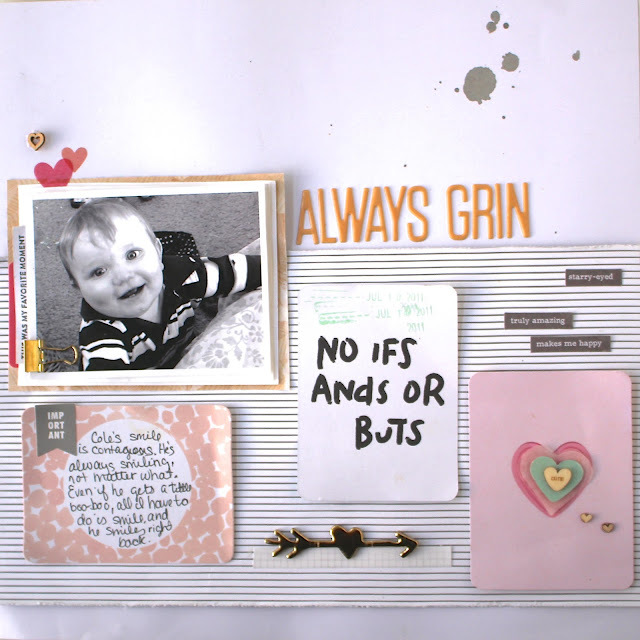 She made a Confetti pocket along the bottom of her scrapbook page. She is awesome. Do you shop at thrift stores? My mother loves them. I remember as a child, hunting through shelves of nicknacks to find a beautiful treasure to call my own, well after a good cleaning. Even as an adult, I love rummaging threw piles of books, racks of clothing, and bins of previously- loved goodies. I'm not a huge shopper, but at second stores I can go a little crazy and not feel guilty of spending too much money. 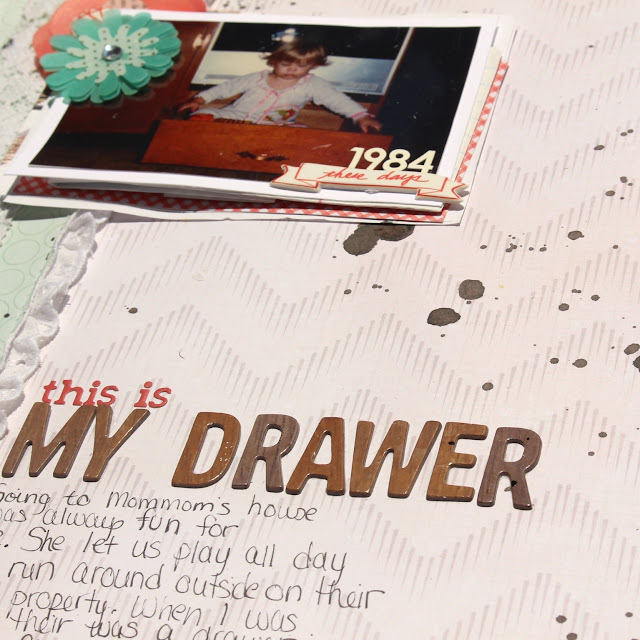 In my new THRIFT STORE JUNKIE Episode, I share my DIYScrapbook Embellishments. I'm surprised at how well they turned out. 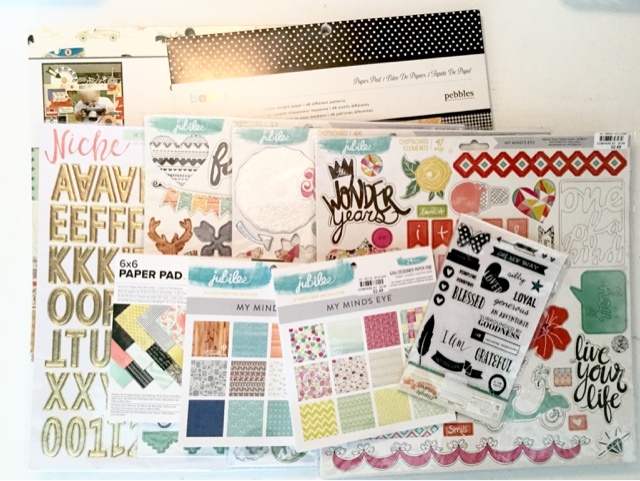 Stay tuned for my first scrapbook process video using my thrifty finds and DIY embellishments. Have you ever used thrift store treasures on your pages? I would love to know. Scrapbooking from the Thrift Store with VIDEO. My name is Andrea, and I'm a THRIFT STORE JUNKIE. It's taken a long time to admit this out loud. The truth is, the thrift store calls my name. It says ( in a spooky voice) , "Andrea, come to me. I have beautiful, unique treasures that you can hoard in your home. Some are sparkly, and some are dingy, but you NEED them. You NEEEEEEED THEM!" Seriously......whats wrong with me? Actually, do you know what? I don't care whats wrong with me, thrift stores are AWESOME-SAUCE! I rarely find scrapbooking items from my local thrift store. But when I do, I add it to my stash and forget that I bought it. A fews days ago I hit the Jackpot. I found like 100 sheets of 12x12 scrapbook paper. I had to pinch myself. I mean it wasn't designer paper or anything (Im also a designer paper junkie) but I liked most of the patterns, so I bought all of it for $1! What? 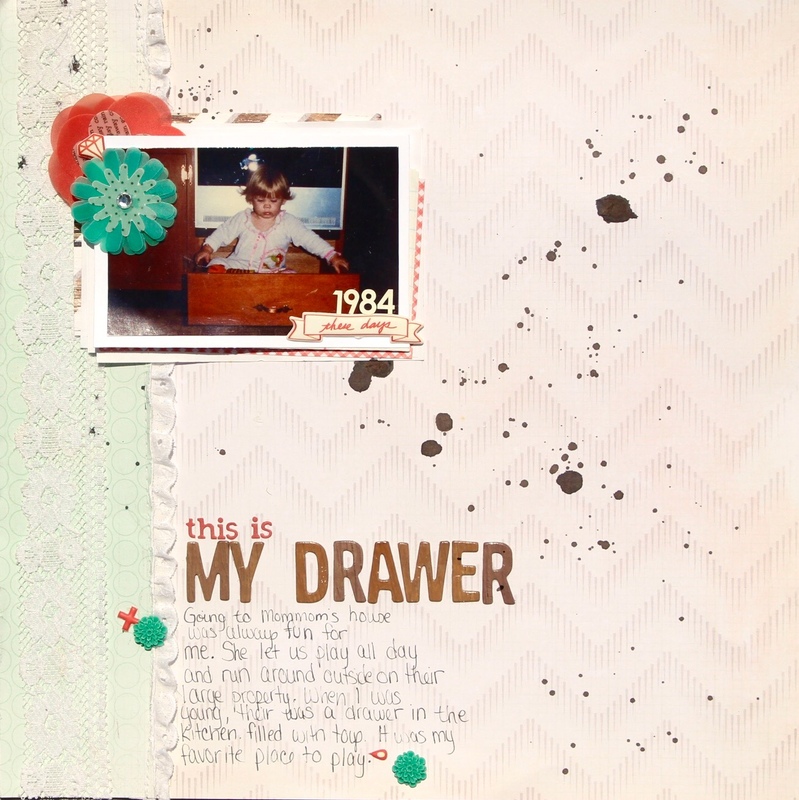 In my new Youtube Series, I make scrapbook layouts from my Thrift Store Kit. My kit is limited to only items from the Thrift Store. What I think is cool about this is that it will really push the limits of my creativity. I'm kind of in a slump and I need to light my creative flame again. Next up on "THRIFT STORE JUNKIE"- My DIY THRIFT STORE EMBELLISHMENTS. Do you use thrift store items in your crafting? This is a photo of me when I was 2 years old, playing in my Grandmother's kitchen drawer. I was even a weirdo at 2. THE SCHEME: Used all 5 colors. EVIDENCE: Used stripes, scallops, numbers, flowers, and paint. TESTIMONY: I journaled about a favorite childhood memory, I wrote my journaling on my background, and I used the Inspo word: play.